Two signs that crack me up | Where to next? I love the goofy things you see on foreign billboards and other surfaces. These two really touched my funny bone. The blue one on the left was on the inside of a toilet door at the Teleferico (cable car) in Ecuador, Quito. The promise of true love ‘forever’ and he doesn’t even know her last name! The other is a billboard near Turjillo, Peru. 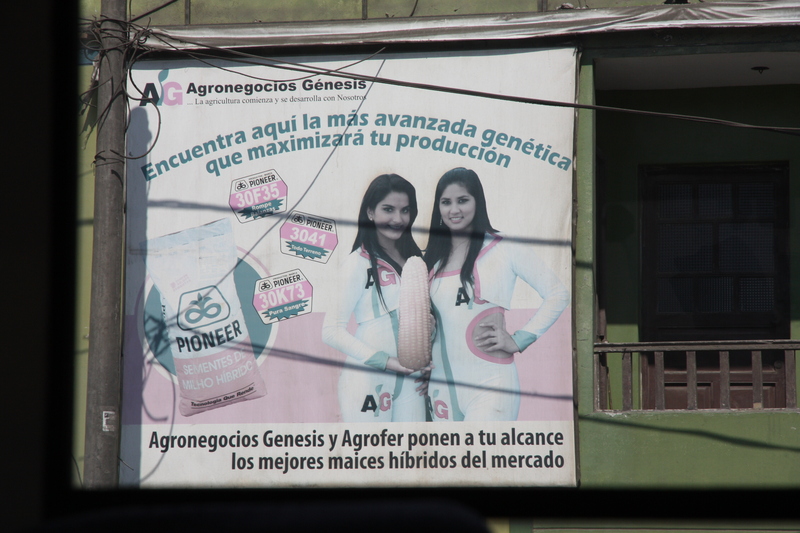 These two corn-fed gals (the one on the left is holding a giant ear of corn) are advertising hybrid seed. Interesting that pretty girls and a cut-out dress are an important part of getting the message through? Mind you I have seen quite a few scantily clad poster girls on calendars hanging in the garages of South America. P.S. I’m sitting in a pub in Huacachina, Peru, waiting for the dune buggy adventure to start. We’ll finish the day with downhill sandboarding, pisco sours and sleeping under the stars.